It’s Easter – and what could be more seasonal than spicy Hot Cross Buns? Try our recipe - flavoured with dried fruit and orange zest - and enjoy with your family. They’re not always hot and hardly ever cross – so where did Hot Cross Buns get their name? There are theories about pagan symbols and Christian monks, but no one really knows why these buns are topped with white crosses. We do know that they’ve been made in Britain since the 16th century, when goods baked with white flour were regarded as a special treat. Wholegrain, unrefined flour was cheaper and more common so, for most people, these white yeasted buns were a Good Friday special. After Hot Cross Buns were criticised by English Protestants for the ‘Catholic’ symbol on top, Elizabeth I passed a law that restricted their sale to Easter and Christmas. They were sold by bakers, whose calls attracted people from the street, and enjoyed warm. Children sang the traditional rhyme to celebrate their arrival: One a penny, Two a penny, Hot Cross Buns! Today, your hot cross buns are more likely to come from a factory than a baker’s kitchen. “They have become a travesty,” criticises The Times, “through the introduction of Chorleywood industrial baking processes.” What can you do? Well – gather up flour, yeast, and fruit, and bake your own at home! 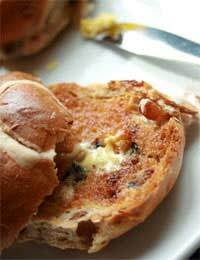 You can adapt this recipe to make plain or fruited Hot Cross Buns. In essence, these are white, yeasted buns with a white flour cross piped on top. Mix the honey, water and yeast in a small bowl and put in a warm place until frothy. In a small saucepan, warm the milk, honey and orange zest and set aside to infuse for five minutes. In another bowl, sift the flour, salt and spice. Stir in the fruit. Make a well in the middle and pour in the yeast and the milk. Stir with a wooden spoon to incorporate, using your hands to gather scraps. Put onto a board now and knead for ten minutes, until the dough is soft and springy. Return it to the mixing bowl, cover with a teatowel and put it in a warm place – under a radiator or in the airing cupboard – for 1-2 hours, or until well risen. Preheat the oven to 220 degrees C. Divide the dough into 12 rolls, shape them into rounds and arrange on two trays with plenty of space in-between. Cover again and leave to rise for 25 minutes more. Meanwhile, mix ½ cup plain flour with enough water to make a piping paste. Put into a piping bag, or plastic bag with the corner snipped off, and when the rolls are risen, cut crosses into the tops. Pipe the white paste into the lines to make crosses. Now bake the buns for 10-15 minutes, and cool a little before eating.